As Flaca and Piper flip through the catalog of lingerie they are going to be making at their new high-paying sewing job, they imagine what the life of the model is like. Probably crying herself to sleep over ice cream and pills, Flaca assumes. But she would trade with her in a second. Flaca and Piper joke that beauty comes from the inside and things like talent and kindness matter more, but they both know better. Beauty gets people a whole lot of advantages over others who don’t meet society’s impossible standards. 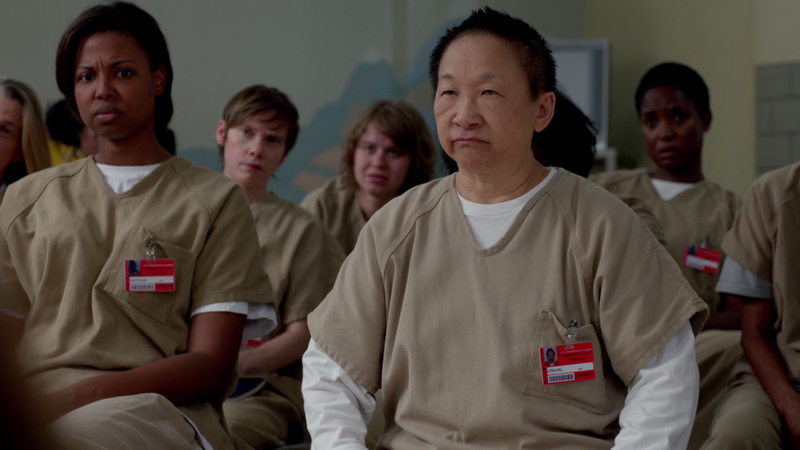 Appearances versus reality and the advantages of being beautiful are at the forefront of the inmates’ stories in this episode, and no one has learned this lesson more than Chang. In her flashbacks, we learn she was humiliatingly rejected by a possible husband because he deemed her too ugly. It didn’t matter to this man if Chang was talented or kind (or thrifty). Because she wasn’t conventionally beautiful, or wearing trendy fashion and make-up, he rejected her immediately. Already feeling like a burden on her jerk of a brother who complained about how much she cost to feed, Chang went to work in his store and then got involved in the black market of what he was really selling. When picking up some illegal turtle eggs, Chang’s looks and quiet demeanor are an advantage, and she’s able to stay under the radar and do what she needs to do. When she inspects the eggs because the box seems too light, she discovers they are not eggs at all — they are ping pong balls, another case of appearances not being what they seem. So Chang raises the alarm and ends up saving her partner. Chang may look quiet and unimposing, but she will strike back hard when you don’t expect it. Chang didn’t fit into the life she was supposed to fulfill, but instead she found her power in other ways. Piper — the tall, leggy, and conventionally beautiful Piper — feels powerful when she wears lingerie. Piper still struggles with her looks even though others say she’s beautiful, and wearing something nice gives her a little more confidence — even if she’s the only one who knows about it. I get that. If I feel good about what I’m wearing, I feel much more together and much more confident. My appearance helps me feel powerful, and my clothing becomes sort of an armor against insecurity. Sophia feels this way, too. After fighting so hard to be who she is, she takes pleasure in looking like herself and taking pride in her appearance. She believes (I believe it, too), that having fun with your appearance and participating in your individuality through your looks can help you feel sassier, and more empowered. Chang, Sophia, and Piper try to feel good about themselves in different ways, but all are fighting the same insecurities and loneliness. When Chang eats alone outside, she sees groups of other women talking and laughing together. Even if she is sure of herself and knows she can order a man’s gall bladder be removed and people will do it, she is powerless against feeling like she doesn’t belong — as we all are, sometimes. In another part of the prison, Red gives Healy some much needed real talk as she lays out exactly how their relationship is not equal or balanced at all. In prison, Red has lost all of her power, and Healy has taken away even being able to get her husband off her visitor list. So she played the last card she had left and she flirted with him to try to get what she needs. It may have looked like the start of a romance to Healy, but as we learned this episode, appearances can be deceiving. At last, we learn how their eyebrows all look good. They tweeze themselves! My inmate of the episode is Chang, who had such an amazing backstory. And I love that she still flies under the radar and gets away with breaking all the rules. I’m glad Taystee and Poussey made up, and I’m glad that Taystee is openly talking to Poussey about her drinking. Piper at least is showing some wear and tear from spending all day hunched over a sewing machine. Red’s back in the kitchen!